What happens when one of the best architecture bureaus of Brazil team up with one of the most famous art and design enthusiasts? 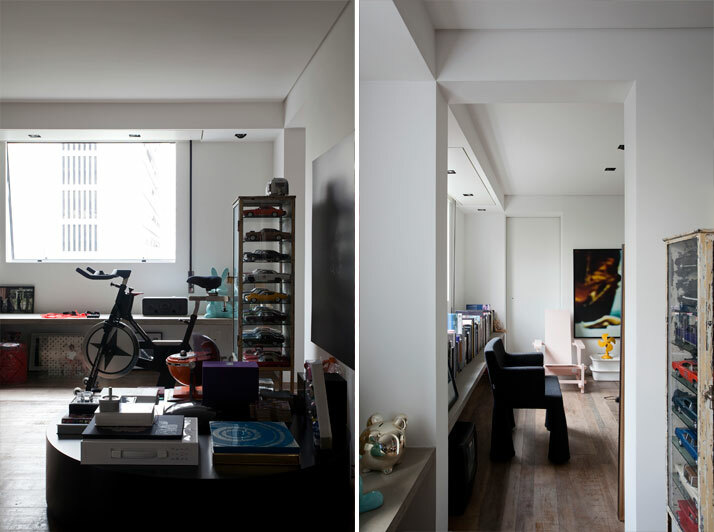 Triptyque studio admit they were more than pleased when Houssein Jarouche called them to reform his 300m2 apartment, giving them total creative freedom. The whole reform took them only one year to be finished, reaffirming the fact that when similar philosophies meet everything is much easier. The result is one of the most fascinating houses we have seen, reflecting perfectly the essence of its owner, full of inspirational contrasts and unexpected surprises. 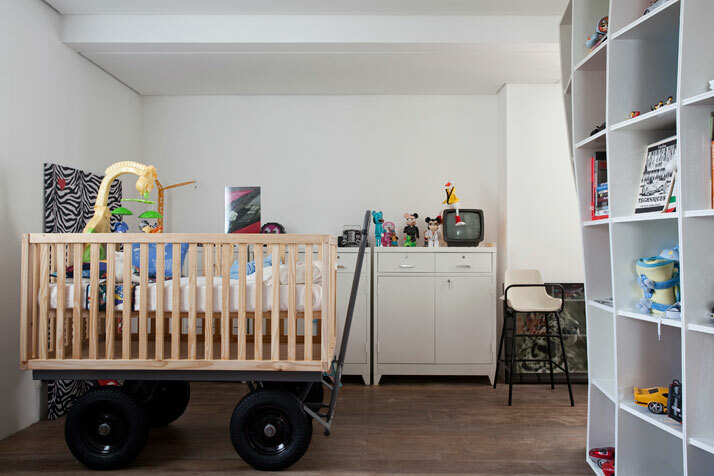 The 300 square feet apartment of proud owner Houssein Jarouche was planned as a great gallery with aligned rooms without an established function. The goal was to stimulate unexpected occupations and give a certain gratuité to the spaces. The main concept was to unify the space and divide it in smaller rooms. “The first step was to clear the space and observe the potentials. The second step was to establish a new hierarchy that privileges the continuity of spaces. The third, to search and create a language of our own”, say the Triptyques. It was a goal for the architects to obtain this continuity without interfering in the richness of internal spaces. The apartment structure was opened to its maximum in order to clear the plan, where a dialogue between the bookcase, the kitchen and the galleries is set. Rough concrete, demolition wooden floors, stainless steel and white walls are the characteristic elements of this apartment, offering a minimal yet warm identity to the space. The art pieces and the furniture are given in this way enough space to obtain the essential visibility. Triptyque team admits with a great enthusiasm the influence of Tropicalism to their project. After all, do not forget that we are in Brazil! The Triptyques quote Dominique Gonzalez-Foerster and her definition of the tropical identity like “something organic, intense, sensorial, vegetal, pulsating, immature and out of control” as their main inspiration. And YES, this apartment moves way beyond these words, full of inspirational juxtapositions and a difficult to tame personality. If there is something that captivates at first glance the attention in this house this is the bookcase, a monumental structure that embraces the technical core of the building (elevators and stairs). It is called Treme Treme and it is a special design by Triptyque. 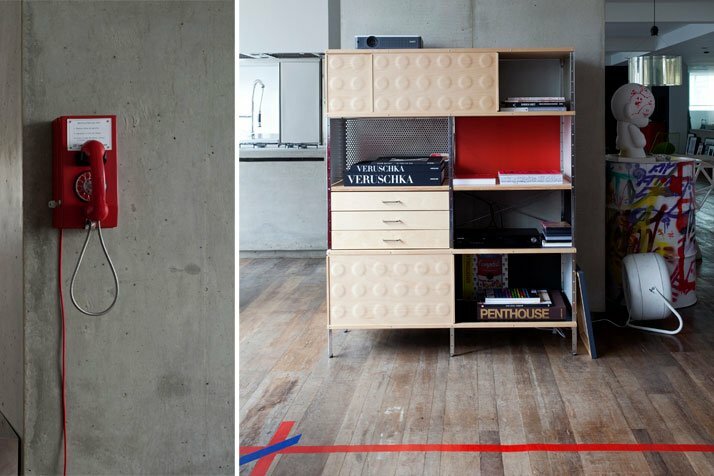 Treme Treme is present in every room and defines the whole project: through the bookcase it is made the entrance to the apartment, “like walking into a cave, through the dark towards the light” as the Triptyques say. 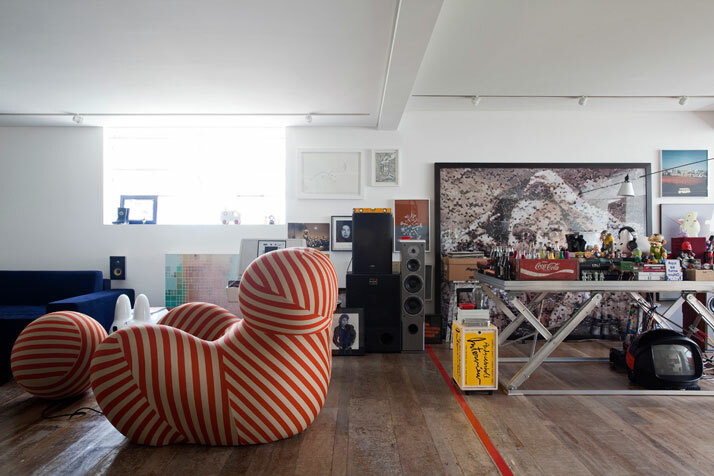 It’s like a giant sculpture that sets the main tone to the apartment and at the same time it is the best display that the numerous collections of the owner could have. 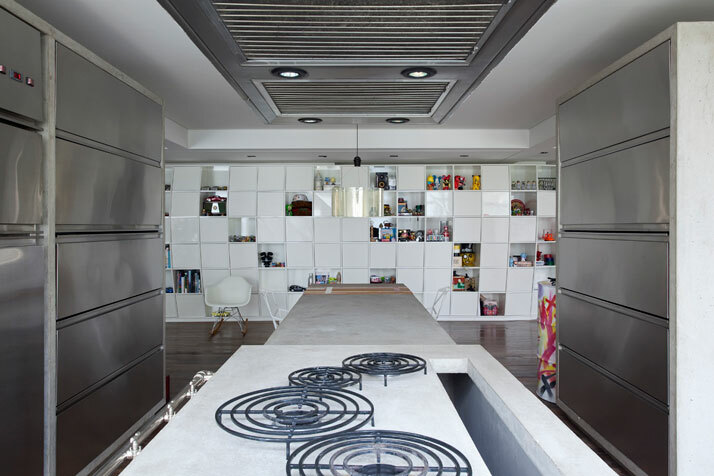 The kitchen is a great concrete stone that stands in the center of the project. As a reference meeting point, it is placed in a central position, in front of the bookcase. Triptyque are certainly not afraid of contrasts: in this house strong elements are confronted, resulting in a poetic conversation. The treated demolition wood and its irregular pieces juxtaposes with the white lacquered bookcase in a visual contrast between the artificial and the rough. If every house is the reflection of its owner, then this one reflects Jarouche’s great passion for contemporary culture and a great fascination for collectionism as a way of understanding life. 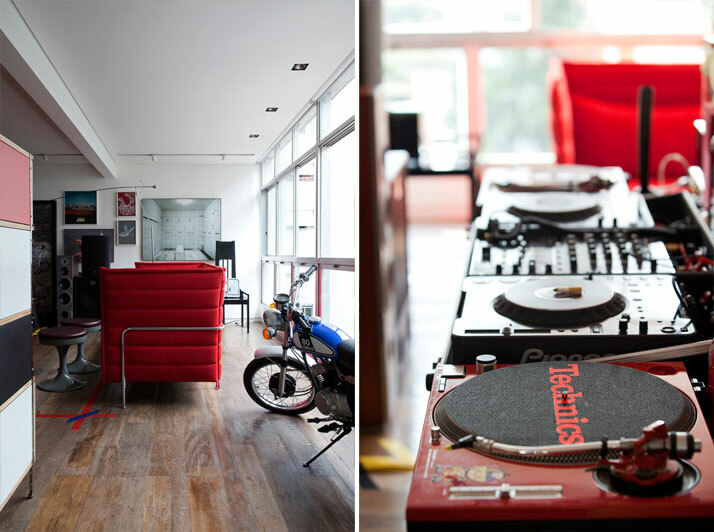 The carefree spirit of this house and the way the various objects are placed give the impression of being in the middle of a big party, full of inspiration and surprises. 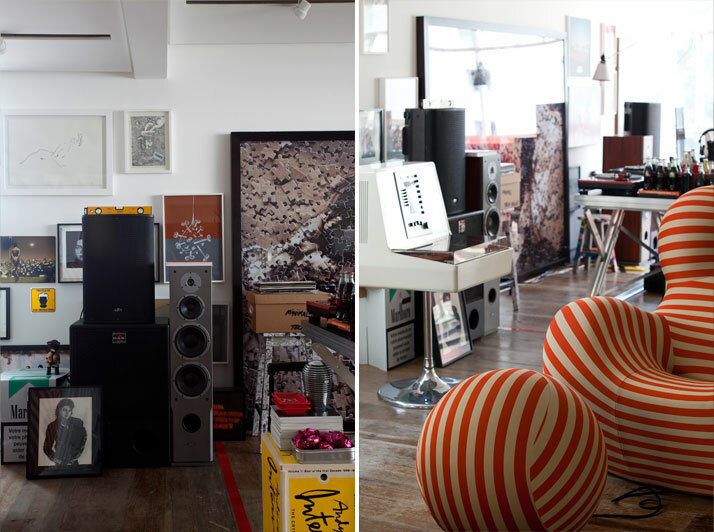 Kozik’s creations mix with Toy2r, Kidrobot and Play Imaginative art toys, advertising merchandise and special promotional items are combined with vintage treasures and art pieces are integrated in the most challenging way, looking at you from every angle. Even the furniture, with the signature of Patricia Urquiola, the Eames or Konstantin Grcic, fit perfectly in this particular universe. 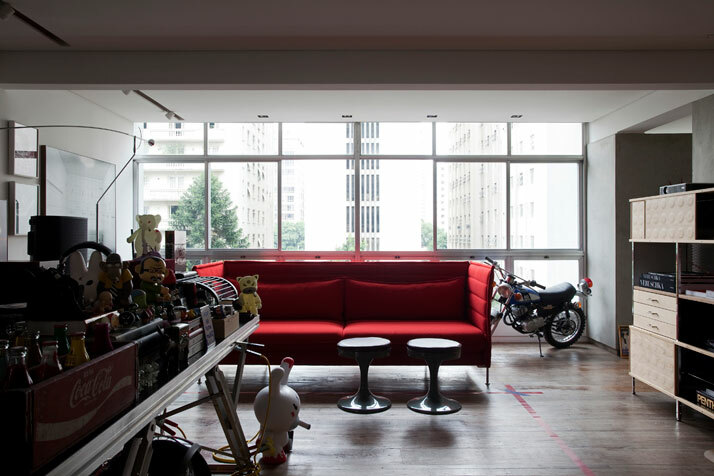 Jarouche has carefully chosen it from his proper shop, called MiCasa, one of the most famous design stores of Sao Paulo, distributing companies like Vitra, Driade, Moroso and Magis. 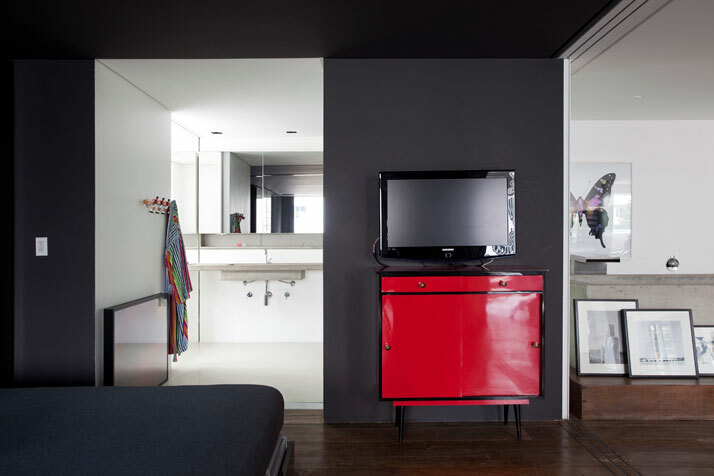 Houssein Jarouche’s apartment is the result of a gratifying coincidence between inspired architecture and bold interior design. Like a fascinating playground for art and design lovers, it offers a unique variety of points of view, sequences and accidents. Moving a step forward, we can say that this apartment reflects the universe of its owner in such a challenging way that it is the perfect extension of his personality. Imaginative and inspirational, full of Houssein’s obsessions, it certainly makes the difference in a world where safe solutions make us bored. After all, Brazil is all about passion, isn’t it? We really hope you felt it as much as we did!